You're in luck. Beginning next week, you'll have a literal menagerie of new weapons. Namely, the animal kingdom. Mafia Wars, a Facebook game by Zynga with over 25 million current players, posted news on their blog stating, "Animals are soon going to be a separate category of items that will be used in fighting and robbing." That means, besides Weapon, Armor, and Vehicle, each mobster will now have an Animal category. According to the game's Facebook fan page, lions, tigers, and pit bulls are just a few of the animals you'll be able to buy and use. Players will be able to acquire animals in two ways. This week only, Mafia Wars is hosting an 'Animals Gone Wild' event where players can loot animals from jobs, fighting and robbing. 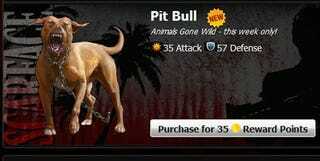 Just keep in mind that any animals found during 'Animals Gone Wild' won't be weaponized until next week. If you're looking for one animal in particular, you can also purchase it at the Marketplace. Looks like next time, Fido can send those wiseguys to sleep with the fishes.